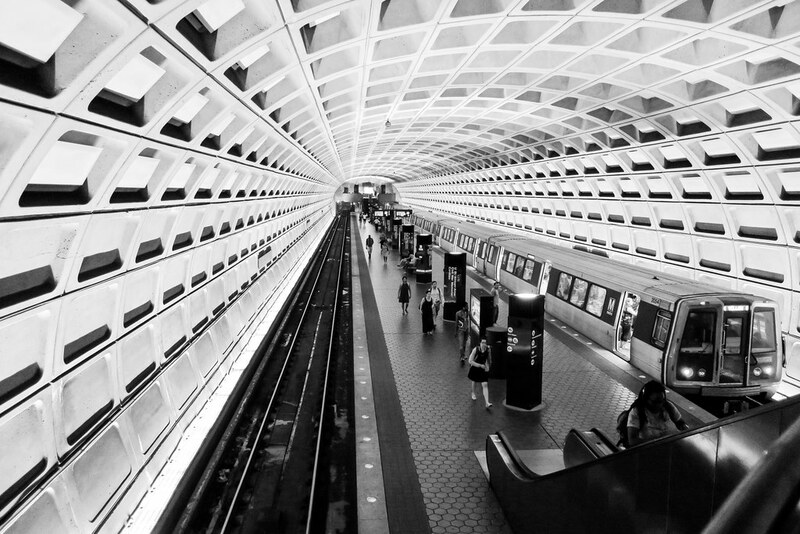 During the campaign, Donald Trump vowed to “drain the swamp in Washington.” According to his formulation, this city was filled with nefarious characters who skirt the rules for their own benefit. But what do you call a President who hawks his daughter’s clothing line on national TV? And sends his surrogates out to do the same? It’s literally a violation of Government 101 – you can’t endorse products as a government official. More than just unethical, it’s illegal, and one of the first things you learn upon entering federal service. Don’t blame The Swamp for this endemic corruption. From stiffing contractors to swindling students, Trump exhibited a pattern of unethical behavior long before he set foot in this city. I know, it’s easier to blame the nation’s problems on a secret cabal in Washington that controls everything. But, as the past few weeks have taught us, it’s shocking how little lawmakers actually control in this country. Trump can issue orders but they go unheeded and unenforced, for they are poorly written and unconstitutional. As I’ve written before, you need the cooperation of the bureaucracy to get things done in government. Dystopias are supposed to be more efficient. Big Brother in 1984 was quite good at quashing dissent, even to the point of erasing the past. But the authors of this dystopia can’t even write a tweet without an embarrassing error. Don’t blame Washington – we’re really not that good at governing the lives of others. Even the Obama administration, staffed with Ivy League graduates, was responsible for a bloodbath in Syria and somehow made healthcare in this country even more complicated and unaffordable. The Swamp is a town of do-gooders, which is not entirely a compliment. The prospect of helping others leads people into government agencies and nonprofit organizations. But it also propels some of the worst excesses of the past couple decades, such as the invasion of Iraq. The architects of that disaster believed that they were liberating people from tyranny. They were doing good. Fortunately, the longer you are here, the less confidence you have in the efficacy of government. Instead, you work to make your community better on a local scale. You could see this in a pair of events on a Saturday afternoon in DC. Cupid’s Undie Run was a charity event, designed to raise money to fight cancer. 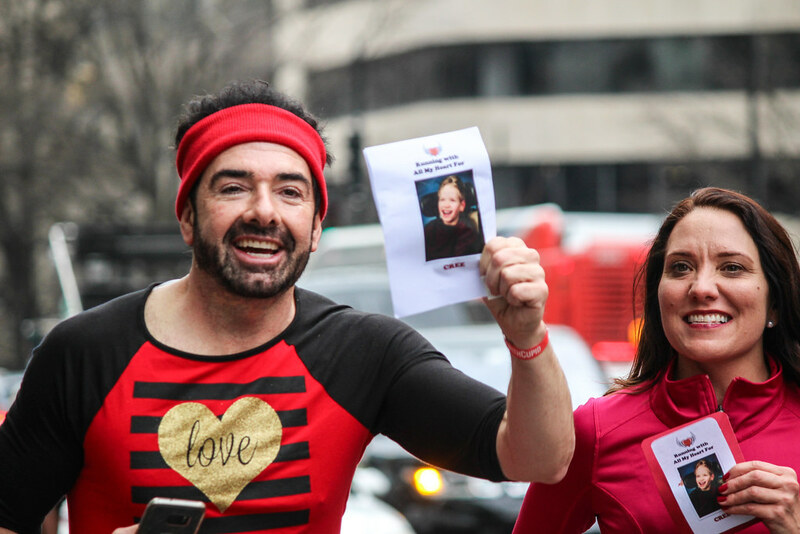 Participants donated money and ran a mile in their skivvies in a good-natured, PG-13 happening. 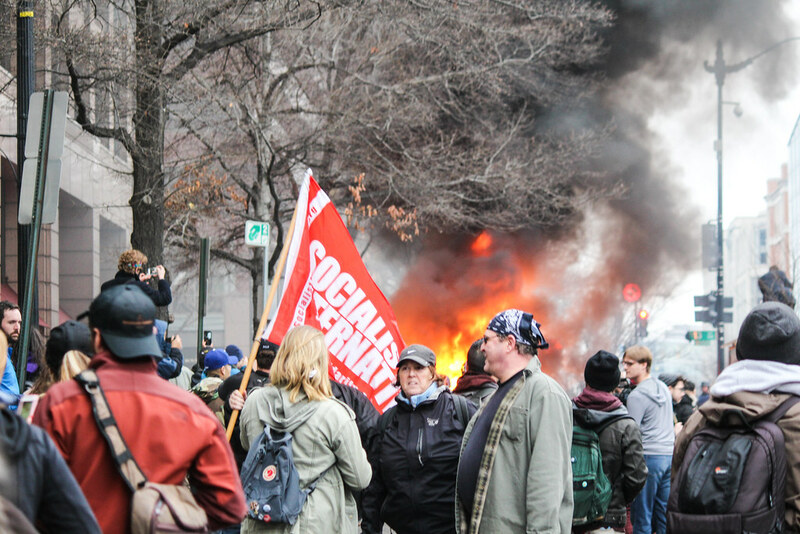 The run happened less than a block from where anarchists torched a limousine on Inauguration Day – the Swamp is compact and walkable. After Cupid’s Undie Run, another event took place, one of a more serious nature, a demonstration against Trump’s immigration policy. 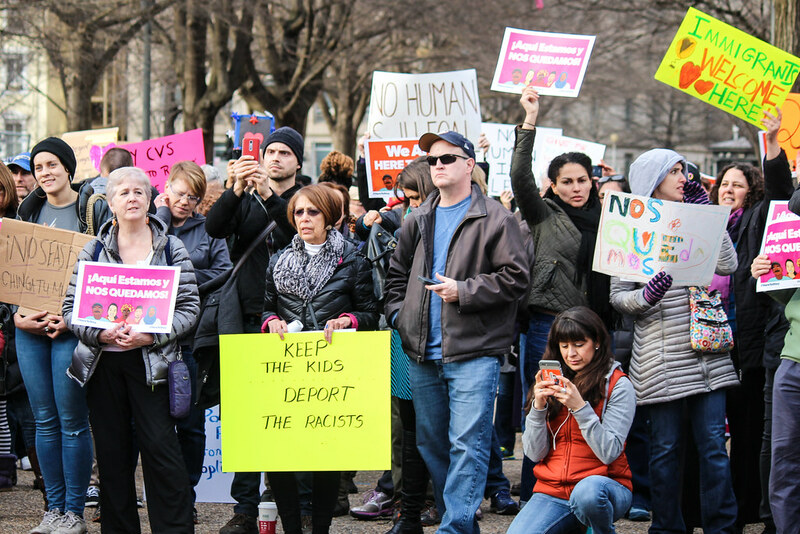 Though his sweeping Muslim Ban order had been stopped, the threat of extreme vetting and deportation remained for the nation’s Latino community, who gathered in an emergency basis in front of the White House. This was just one of several demonstrations that day. Earlier, was Primal Scream Against Trump (which I was sorry to miss) and later was a rally for free speech. How do these demonstrations come together? The Internet. Groups post their rallies and marches online and people show up. The denizens of The Swamp. They look like quite normal people, don’t they? The Swamp is a poor metaphor for the corruption and incompetence that plague American politics. That government no longer works is not due to a place. It’s due to people, most of whom are from out of town. If you live in The Swamp, you want government to work, for it’s the industry that defines your city. It’s why you’re here. The chronic dysfunction comes from the creatures that slither into The Swamp every four years. Like Trump, they want to make money, cause some trouble and then get out. Without these interlopers, we’d have a healthy ecosystem that delivers results to the American people. Iraq, Obamacare, Muslim Ban. Don’t blame The Swamp for these calamaties. Blame yourselves and the elected officials you send to rule here. No Muslim Ban protesters in front of Charlie Palmer’s, where Paul Ryan was having lunch. 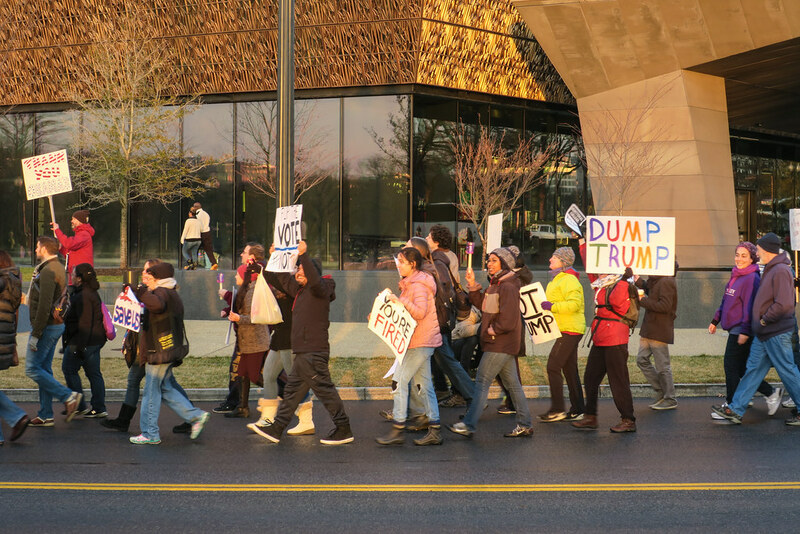 Anti-Trump demonstrations are a constant now in Washington, DC. They happen multiple times a day, the residents of this city and beyond having a limitless appetite to protest Trump’s Muslim Ban and other outrages. You run into them in random, unexpected places – like Charlie Palmer Steak on Capitol Hill. The word had gotten out that Speaker Paul Ryan was having lunch there. A very well-organized protest appeared, marching past the windows of this high-end joint. Lobbyists chowing down on $60 Wagyu Strip Steak watched a parade of women bundled-up against the cold demonstrate against the Muslim Ban. Who are you going to stand with? 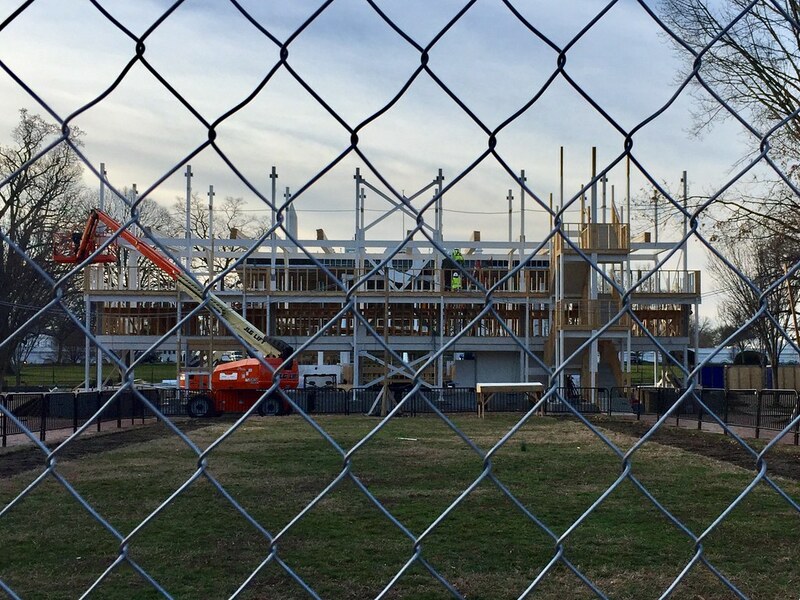 Lawmakers who send Syrian refugees back to war zones while they enjoy expense-account lunches? Or ordinary folks like those who came to protest? 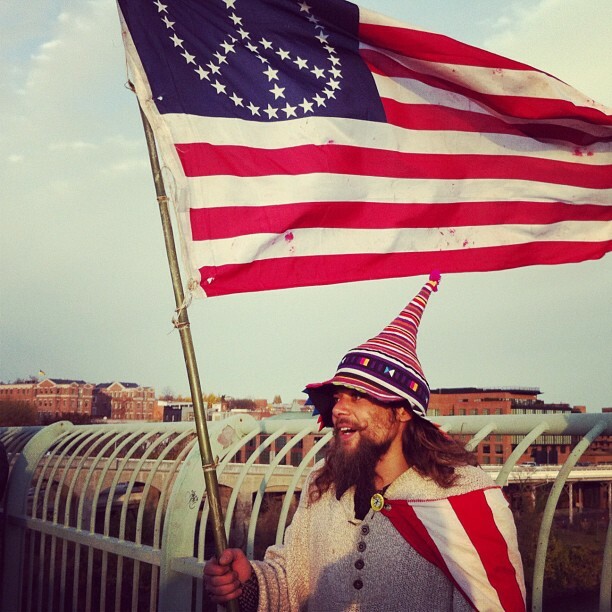 I am jaded, cynical, having seen scores of protests in DC. But the Trump protests have a different quality to them, attracting not just the young and disaffected but plenty of middle-aged, middled-classed people. 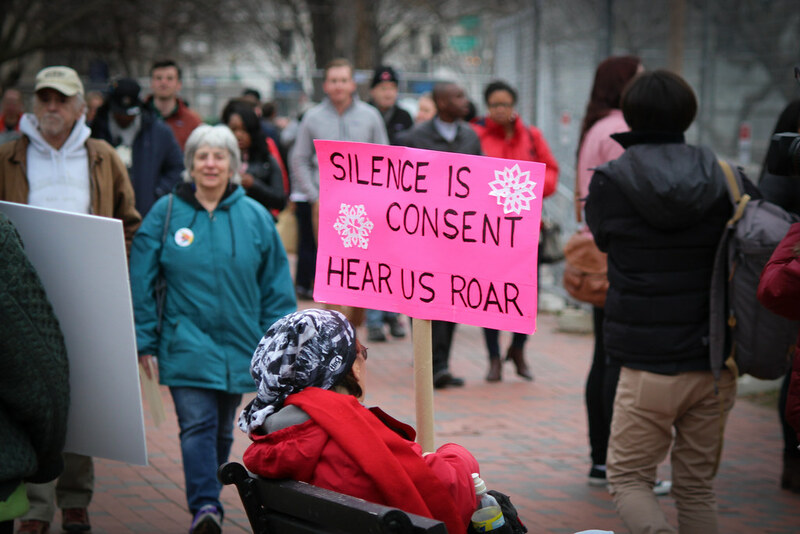 That was evident on a freezing Friday when another protest took shape across Constitution Avenue from the White House – one of at least three that occurred that day. The wind chill was in the 20s but that didn’t stop demonstrators signing a wall rejecting Trump’s bigotry. That you can draw a crowd on a cold and dark Friday afternoon speaks to the strength of the anti-Trump forces. It’s supply and demand. 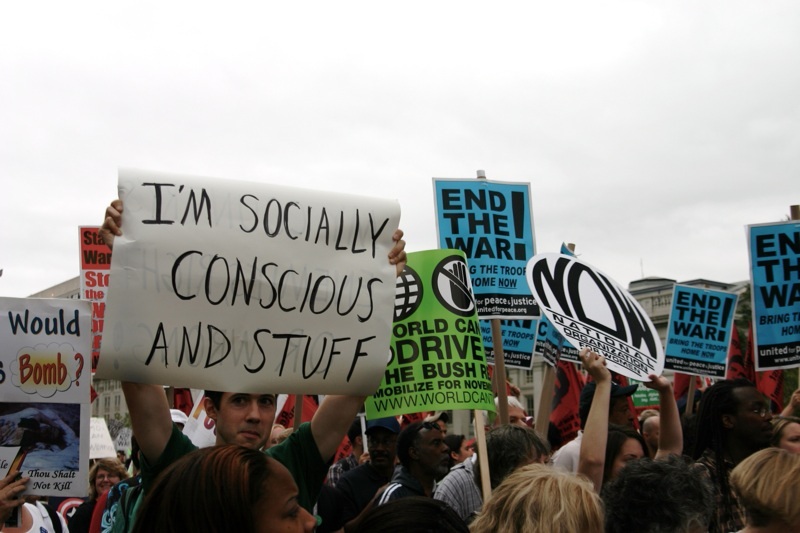 Everyone wants to come out and protest so demonstrations occur on every day of the week. I talked to people who came out to this protest because they couldn’t make last weekend’s march. They felt compelled to show up for foreign friends and coworkers that were terrified by Trump. 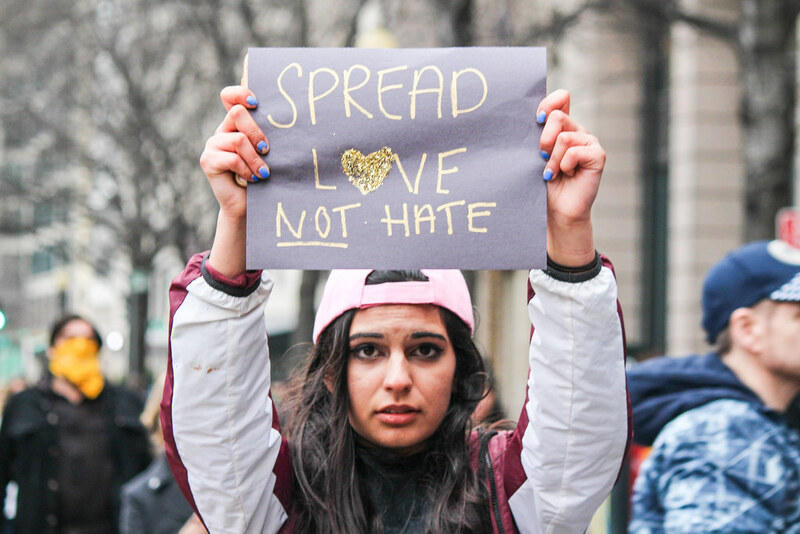 An open letter to Trump, rejecting his bigotry. It was cold. 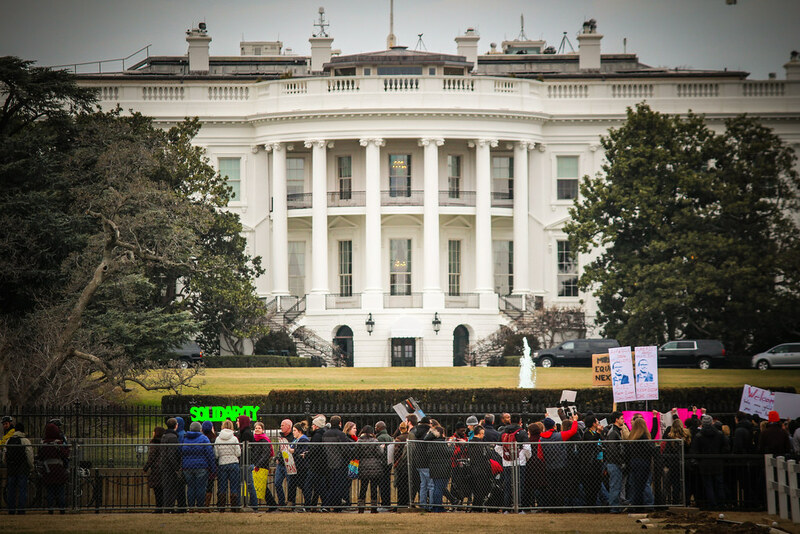 I biked home, going by a protest on the other side of the White House, demonstrators pressed against the fences, chanting into the dark night, though Trump was hundreds of miles away, brooding and tweeting from his Palm Beach mansion. A few blocks away, a third protest was gearing up, a dance party that would take over Pennsylvania Avenue. Thousands would dance in the streets while thousands more would watch online. The revolution will be live streamed. Cyclist carries #Resist banner in the freezing cold. 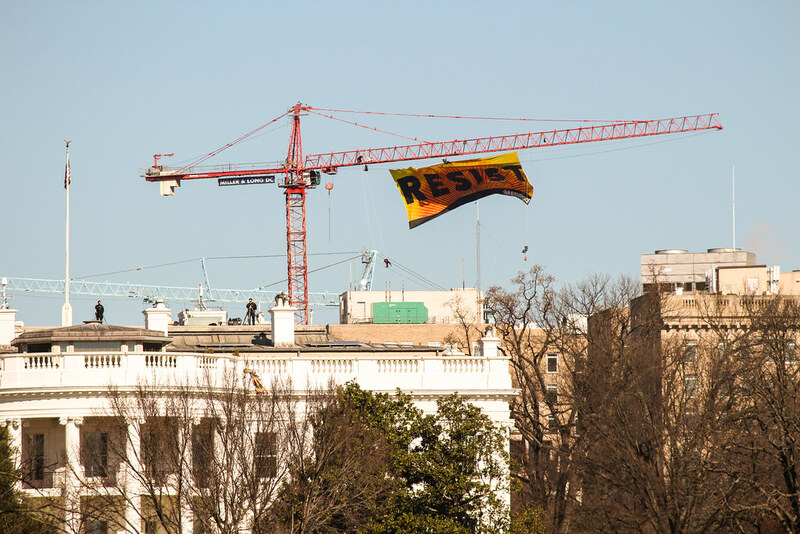 Greenpeace hung this Resist banner on a crane overlooking the White House. Strange days indeed, where I’m retweeting Van Jones. My politics don’t fit into an easy category. I’m socially liberal, believing that people should be free to do whatever they want, as long as they don’t harm others. nothing but a big blind beast, stumbling across the American landscape, more likely to crush you than help you. The economy is the most important issue to me; the biggest moral issue of our age is the lack of real economic growth, for it leaves millions unemployed and underemployed in the vast heartland of our country, a tragedy of abandoned towns and people, like a modern Grapes of Wrath. In a fit of 2008 optimism, I voted for Obama but then switched to Romney in 2012, wanting a President that would focus on jobs. He doesn’t look so bad now, does he? Trump vs Clinton was a nightmare choice for me, literally Kang and Kodos. In a fit of pique, I wrote in independent Evan McMullin (I might have a thing for Mormons), knowing that blue DC was going overwhelmingly for Hillary. 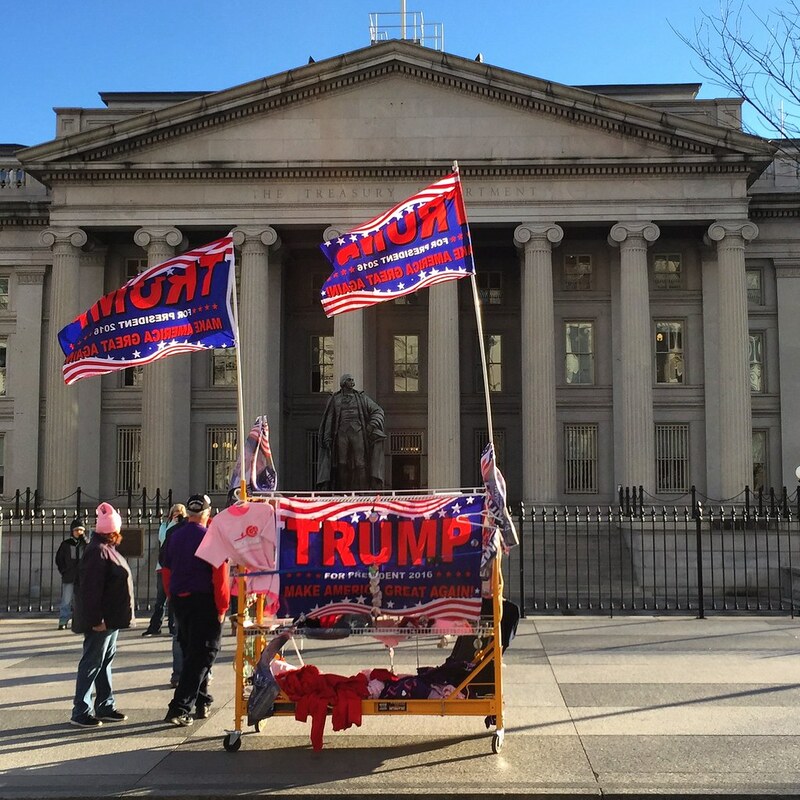 Few takers for Trump merchandise for sale outside the Treasury Building. Like everyone else, I expected Her to win. When she didn’t, I was ambivalent, fictionalizing my response in Victory Party, my tale of DC on election night. I am ambivalent no more. What does it take to get someone as jaded and as cynical as me off the sidelines? A week of chaos from the Trump administration, from the graceless “American carnage” inaugural address to the dissing of the Women’s March and on to the Monday night massacre firing of the acting Attorney General. Trump is a bully, now with the overly vast power of the federal government behind him. There’s never been a better argument for limiting the size and scope of the executive branch than Donald J. Trump. I expected the evil – it’s the incompetence that surprises me. They have no idea how government works. And despite their purported social media savvy, it didn’t occur to them that public servants, such as the National Park Service, could push back anonymously using these same tools. Rather than uniting the country around the need for economic growth, Trump has issued a series of bizarre and poorly thought out decrees. It’s government by tweet, straining this country’s democratic institutions beyond the breaking point. 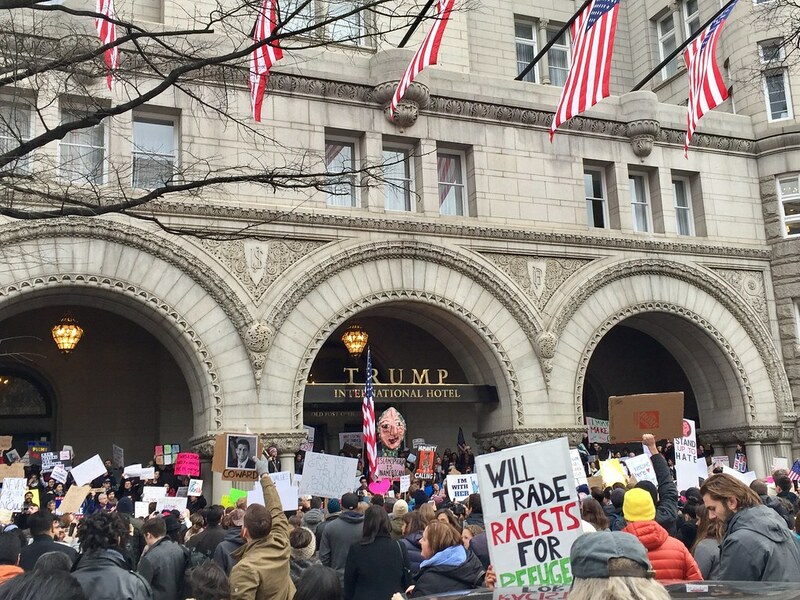 Muslim ban protesters besiege the Trump International Hotel on Pennsylvania Avenue. Me at the Muslim Ban March. 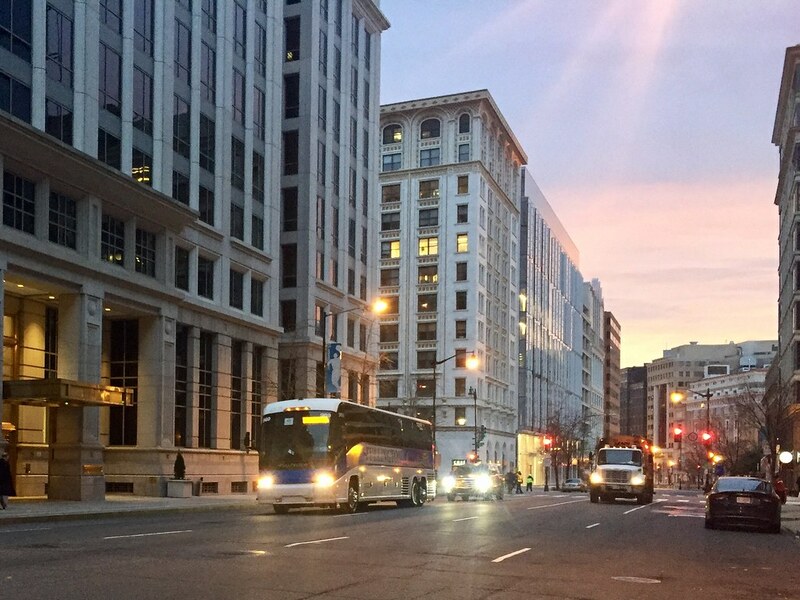 I used Capital Bikeshare to get around and take photos. The streets of DC have been filled with demonstrations the size and scope of which I have never seen before. 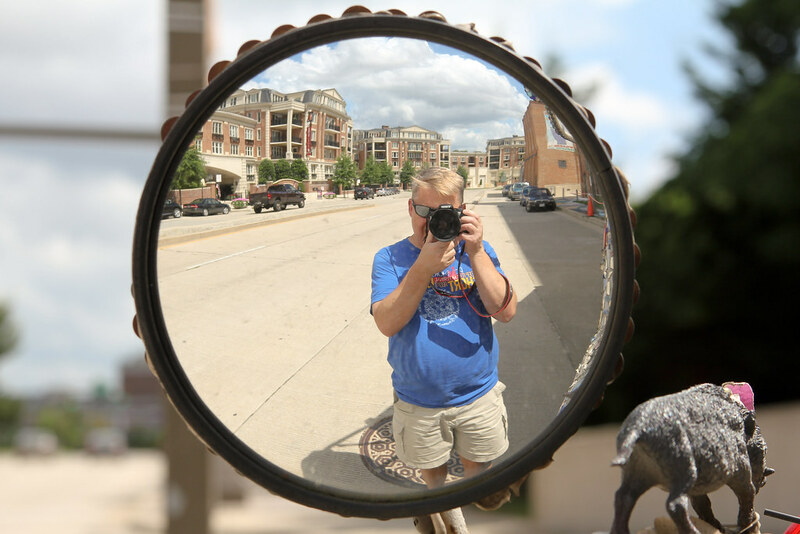 And I’ve been out, biking around the city with a camera, capturing the moment. And participating as well, something I never thought I would do. As Van Jones points out, it’s no longer a question of Democrat vs Republican. It’s whether you believe in democracy or not. If you do, then you must resist. Inauguration Day ended with me running in fear down K Street, as the DC police fired “flash-bangs” to clear the mob of anti-Trump protesters. 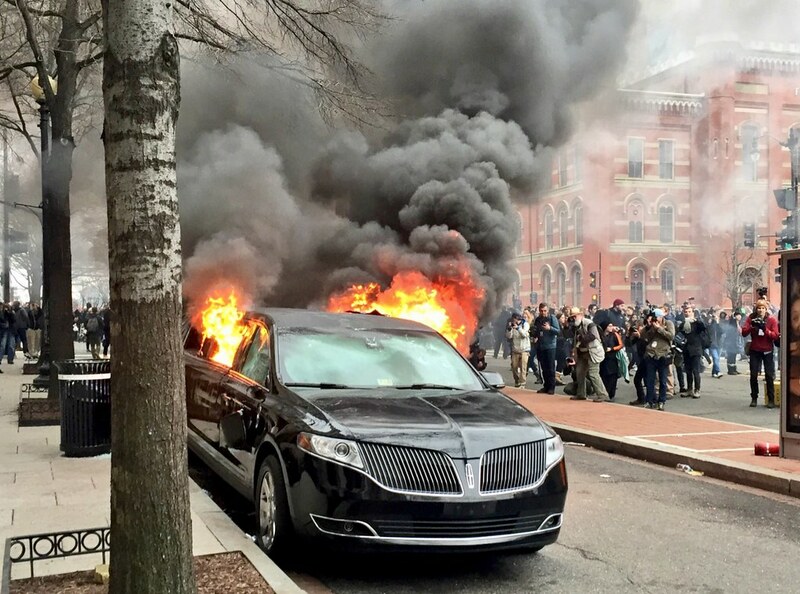 Anarchists had set a limo on fire and were trying to stop the fire department from putting out the blaze. The explosions made me jump but it was being in the middle of a crowd that suddenly turned tail that was so frightening. It was run, or be trampled. I needed a large bourbon when I got home. The next day was the Women’s March on Washington, the first stirrings of opposition to President Trump. No one was sure how many people would attend. The crowd turned out to be three times the size of the inauguration, nearly half a million people crammed into the streets of DC. The march was so large that they couldn’t march, the route being filled with people from mid-morning until night. Not being a fan of crowds, I was going to meet some friends after the march. But they couldn’t get to me and I couldn’t get to them, separated by a few blocks and a couple hundred thousand people. 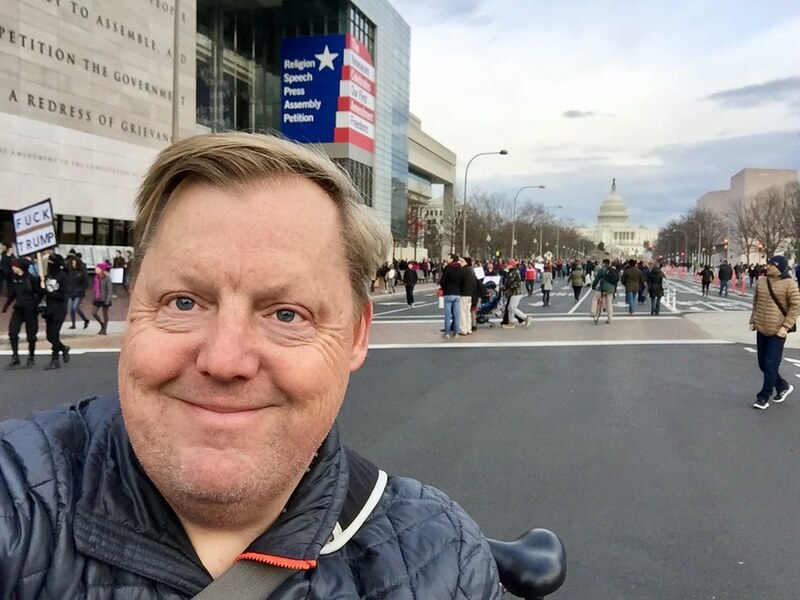 On Inauguration Day, I rode my bike down H Street, virtually alone. Now, a day later, tens of thousands of people streamed down this street by the White House. Rounding the corner on 15th St, I ran into a vast and immeasurable horde of women in pink hats pouring up from the Mall. I’d never seen anything like it, not even during the Obama inauguration of 2009. I wanted to get to Freedom Plaza so I could get a photo of Pennsylvania Avenue and marchers stretching to the Capitol. But I couldn’t get there, feeling like a salmon trying to swim upstream. A never-ending crowd marched down the inaugural route, doing their own alternative parade, cheered on by protesters occupying the bleachers lining the route. I dipped into one little corner of this vast throng, before turning to go back up 14th St. There’s a little crest on the street. Looking behind me, I could see the crowd stretching down 14th all the way to the Mall, where thousands more were marching. More people than I’ve ever seen in my life. Every few minutes, a vast cheer would rise up, echoing off the office buildings. 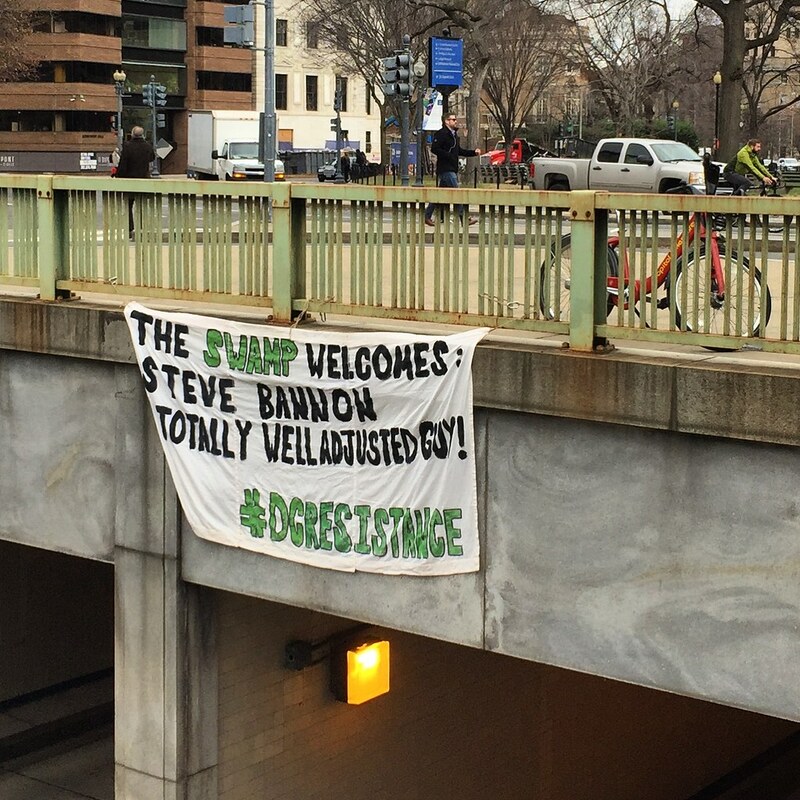 In contrast to the Inauguration Day protests, everyone was happy. There were no arrests. No one was masked. 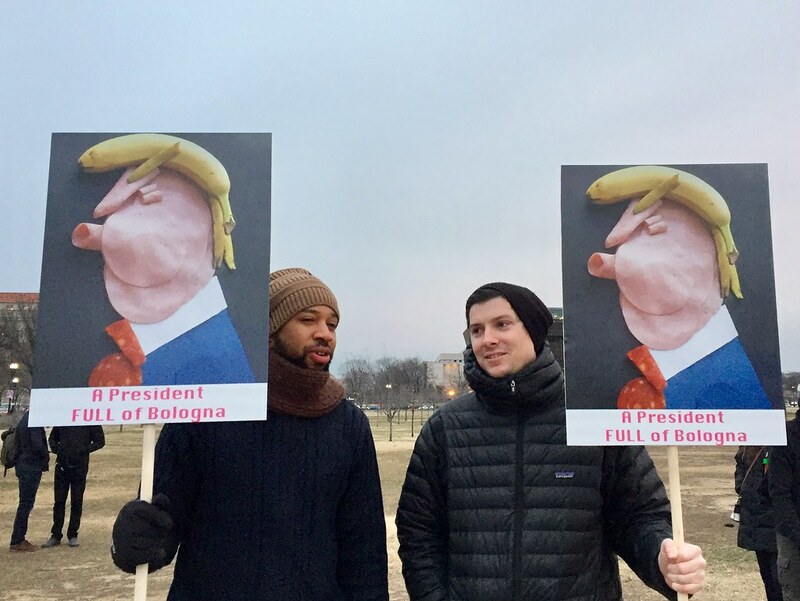 People smiled, took photos together and laughed at the signs mocking Trump. The celebration went on into the night, demonstrators with signs parading around the White House for hours after the official end of the march. I met friends for dinner afterward, going to an Irish bar a dozen blocks away from the protest. Far enough where I thought we could get a table. Wrong. Every seat of the bar was filled with women in pink hats. The TV was turned from a basketball game to CNN. When the broadcast showed video from the march, the crowd cheered, their voices filling up the bar, the sound of a vast protest movement coming to life. No fan of Trump, I contemplated leaving the city for the Presidential Inauguration. I ended up staying for leaving was a kind of surrender. 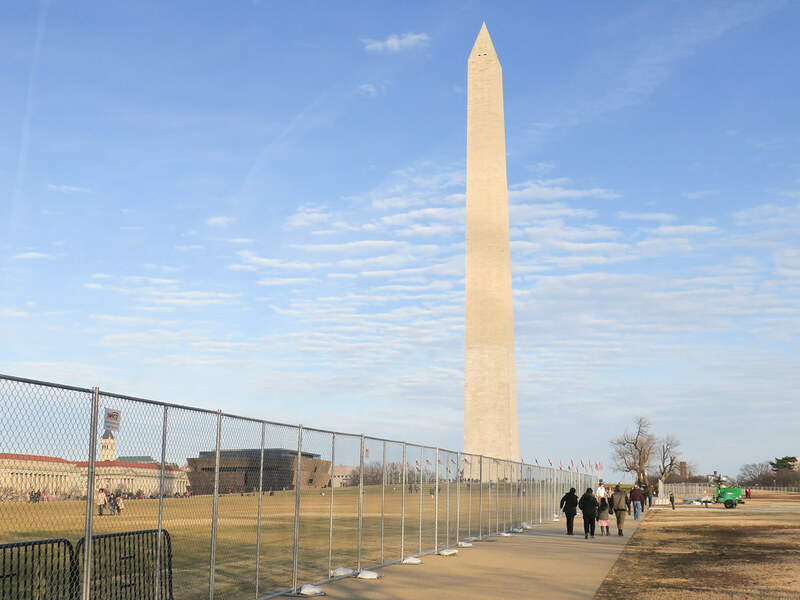 The inauguration was just in one corner of the city and could easily be ignored. But the pull of history was too strong to ignore. I’m a writer and a photographer. These historic events are material for me, to be captured in photos and transmuted into fiction, like how I turned my election night experience into my short story, Victory Party. I wanted to be in the room where it happens. Or at least on the street. On Fridays, I go to Friday Coffee Club, a meetup of bike folks at A Baked Joint. The coffee shop was open so I went, figuring that I might run into some inaugural crowds. Nope. A couple hours before the inauguration and the streets were empty. 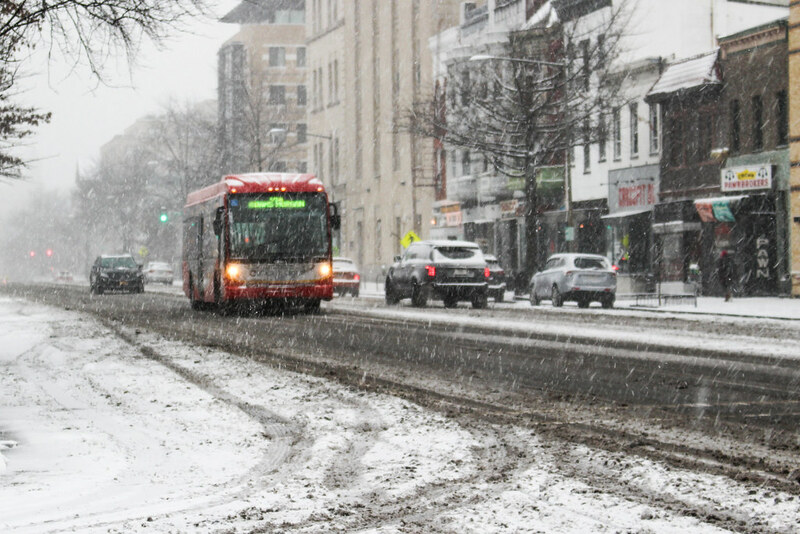 H Street had been blocked off to traffic so I rode down the middle of it, just seeing a couple of buses go by. There’s always a line at A Baked Joint but on this Friday, nobody was there. And there were no bikes out front. 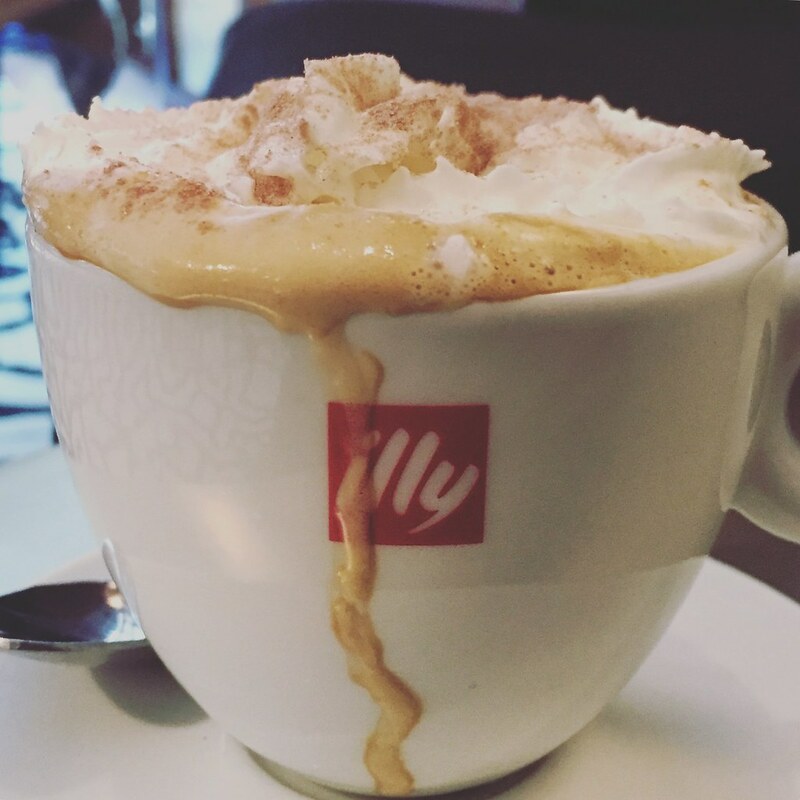 Just a couple of Friday Coffee Club people had made it in. The only action on the street was from the anti-Trump demonstrators, who were assembling at McPherson Square. It started to rain, so I headed home to watch the inauguration. As Trump wrapped up his “American carnage” speech, I heard a helicopter overhead, hovering just a few blocks away. A well-organized band of anarchists (oxymoron alert) had thrown rocks at Starbucks and other businesses. 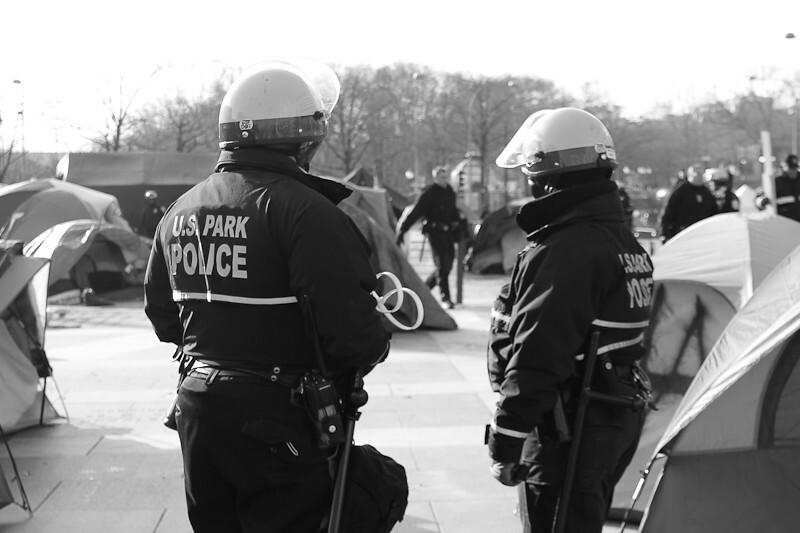 It takes a lot to get the DC police to arrest you but they did, making more than 200 on Friday. The helicopter went east and continued to hover, eventually drawing me out my apartment, camera in hand, expecting to see one of those typical DC protesters where people chant and sit in the street. 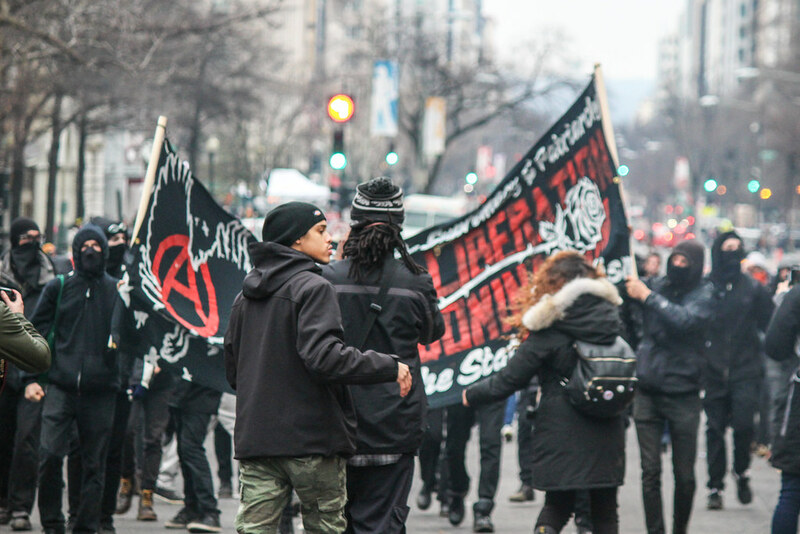 But McPherson Square, packed with anarchists and the Black Bloc, had a very different vibe. 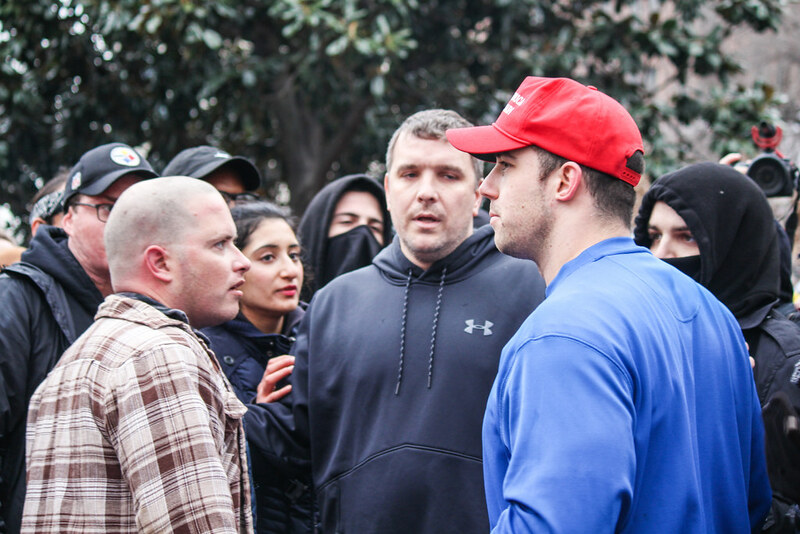 Within five minutes of entering the park, I saw a Trump supporter get punched in the head and knocked unconscious by a guy who was dressed like Bane. The First Aid tent was nearby; the medical volunteers did nothing, unconcerned about a Trump supporter’s injury. Instead, National Guardsmen came into the park to rescue the guy. The police were lined up outside the park and would not come in. I live in DC. It’s my city. 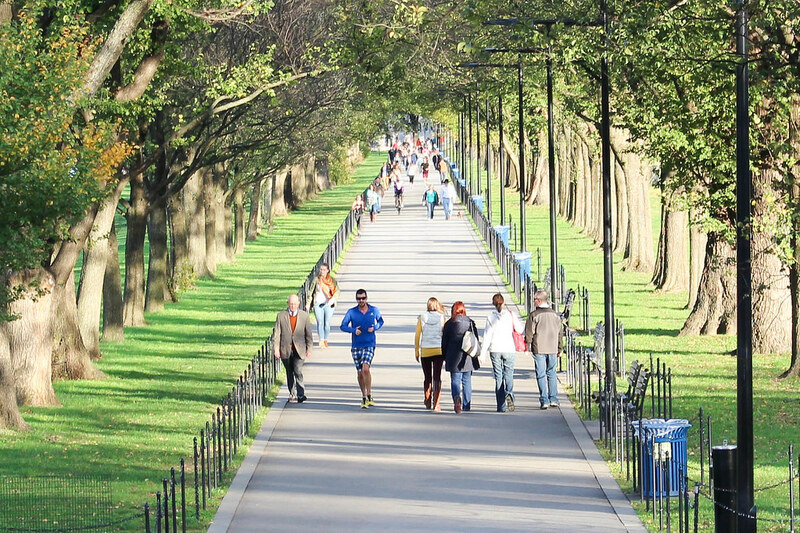 I felt afraid in that park, in a way that I never did during the Occupy and other demonstrations in DC. Violence has an ugly quality that’s instantly recognizable. You feel it when it occurs, an anxiety rippling through the crowd. The kids in the hoodies weren’t going to square off against the heavily armed police. Instead, they were looking for soft targets, such as businesses and lone Trump supporters. Or you and me, if they wanted to – the police were not coming into the park. I left. 14th and K was the epicenter of the protest. In front of the Washington Post building, the windows of a limo had been smashed in by the demonstrators. Protesters were standing on it. 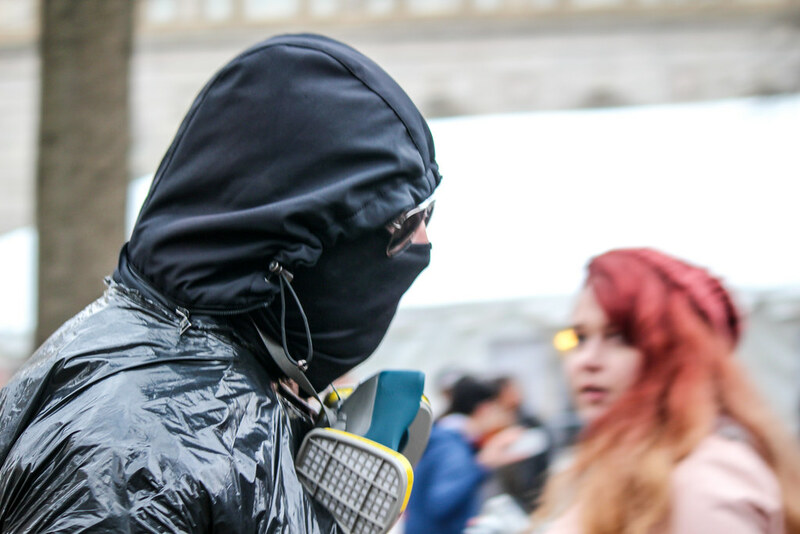 Then members of the Black Bloc marched by, their faces covered. Someone threw something into the limo. It caught fire, black smoke billowing up into the sky. I snapped some quick pictures. People said the gas tank was going to blow. Others said the police were coming. 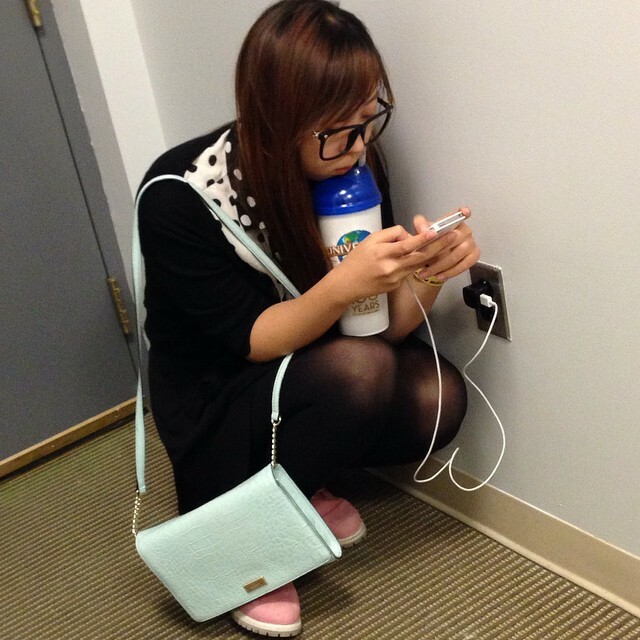 As I turned to leave, I saw a woman behind me, silently pleading for peace. It’s her heartbroken face that I’ll remember more than anything else. Within seconds, I would be running as the police fired flash-bangs into the street. If you’re a progressive, these are dark times indeed. You’ve suffered a historic and surprising loss, one that seems to usher in a new age of evil. Great works of literature, such as The Lord of the Rings, can provide consolation to discouraged liberals in the new Trump universe. Look for hope, not from the east, but in the big books of fantasy. From Gandalf to Aslan, the characters in these imagined worlds endured far worse than a bright orange politician. They took on and defeated enemies who would enslave them. Let their stories be your guide to surviving the Age of Trump. When it comes to confronting evil, no one is more inspiring than Gandalf the White in The Lord of the Rings. Pulling together an unlikely coalition of misfits, he defeats evil in its purest and most implacable form. If you’re Gandalf, you fight on, even as you plunge into the pit with a Balrog. That means that you do what you can, every day. Those who listened unwearily to that voice could seldom report the words that they had heard; and if they did, they wondered, for little power remained in them. Mostly they remembered only that it was a delight to hear the voice speaking, all that it said seemed wise and reasonable, and desire awoke in them by swift agreement to see wise themselves. When others spoke, they seemed harsh and uncouth by contrast; and if they gainsaid the voice, anger was kindled in the hearts of those under the spell. Saruman possesses the oratory of Ted Cruz. And, like Cruz, he’s taken every side on every issue. He turned evil because evil was going to win. Better to be on the winning side. Gandalf wisely keeps him in Orthanc. And if Saruman is Cruz then who is his treacherous companion, Grima Wormtongue? He tries to weaken King Théoden of Rohan and nearly succeeds. Playing the role of Wormtongue in the Republican Party would be Newt Gingrich, who sought to discredit the Republican establishment from within. Unlike the Lord of the Rings, the Grand Old Party never woke up from its spell. Rohirrim did not ride to the rescue at the Republican Convention. C.S. Lewis would argue that great sacrifice is needed to cleanse the world. In The Lion, the Witch and the Wardrobe, where it’s always winter but never Christmas (which feels like Washington today), it takes blood to put things right in this thinly veiled Christian allegory. Perhaps Hillary, like Aslan, should’ve sacrificed her political ambitions and let a more palatable candidate run for office. George R. R. Martin dismisses these ideas about good and evil. You’re naïve to even think that way and liable to get beheaded if you embrace the hero myth. In the Game of Thrones, you either win or you die. Like Petyr Baelish aka Littlefinger, it’s best to look after your own interest, without morals. His scheming and self-interest represent many in Washington. In the years before the War of the Ring, Gandalf adventured throughout Middle-Earth, defeating monsters and learning about the people under his protection, from greedy dwarves to breakfast-loving hobbits. He could not become Gandalf the White without the forge of this experience. From merry wizards to talking lions, the world of fantasy offers consolation to progressives looking into the land of shadow. At the very least, they’ll provide something to read over the next four years.